Summary: Caleb and his older brother Bobby Gene are delighted to meet 16-year-old Styx Malone one day in the woods near their house. They’re looking to unload a bag of fireworks they won, but that their parents won’t let them keep, and Styx has some good ideas. He tells the younger boys if they keep trading for something slightly more valuable, they’ll eventually be able to get a new moped that the three of them can share. Caleb in particular has a worshipful admiration of Styx, whose free-and-easy ways contrast with the boys’ strict parents. Caleb’s modest wish is to go to the Indianapolis Children’s Museum, but his father insists it’s safer for African-American boys to stay in their small town where everyone knows them. 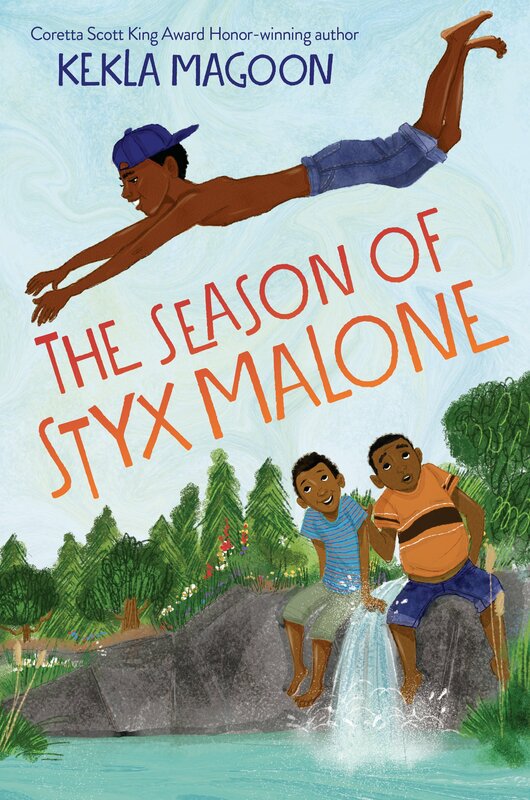 As the summer goes on and Styx’s plans grow increasingly daring–and dangerous–Caleb and Bobby Gene have to make some tough choices about where their loyalties lie. When tragedy strikes, the boys learn the truth about Styx and gain a new appreciation for their family and for each other. 304 pages; grades 4-7. Pros: Caleb is an engaging narrator, and there’s plenty of fun to be had before things get a bit more serious. Many readers will figure out Styx’s troubled life in the foster system before Caleb and Bobby Gene do, but don’t worry, there is ultimately a happy ending. Cons: The story has a contemporary setting, but the boys seem to have a lot of freedom to wander around all day on their own (particularly given their strict parents), and Styx is constantly chewing on candy cigarettes, which don’t seem like they’d be readily available in their small Indiana town in the 21st century. Oh, those candy cigs were such a ‘naughty/bad kid’ tell back in the day. Seriously, though, this seems like a unique angle on an intriguing slice of life.